A good and updated map is an important tool for every hunting party. To be the one with that responsibility can be a burden – but with some structured work it can be a pleasure. The forest grows, trees harvested, roads paved, game trails changes – there’s many reasons why there is a continuous updating of maps. Ever since the Middle Ages, it has mainly been the cartographers who changed and improved our maps but with new techniques and powerful computer programs we have finally reached the threshold so that you can do the job yourself. Do you want physical paper maps for the overview or digital maps on your phone for accuracy? If you create the map the way I describe here, you do not have to choose, you get everything from one source. With good maps the hunt will be more enjoyable and – above all – safer when new hunter can see if they really are in the right place in the woods and easily measure distances to neighboring hunting spots using their phone. 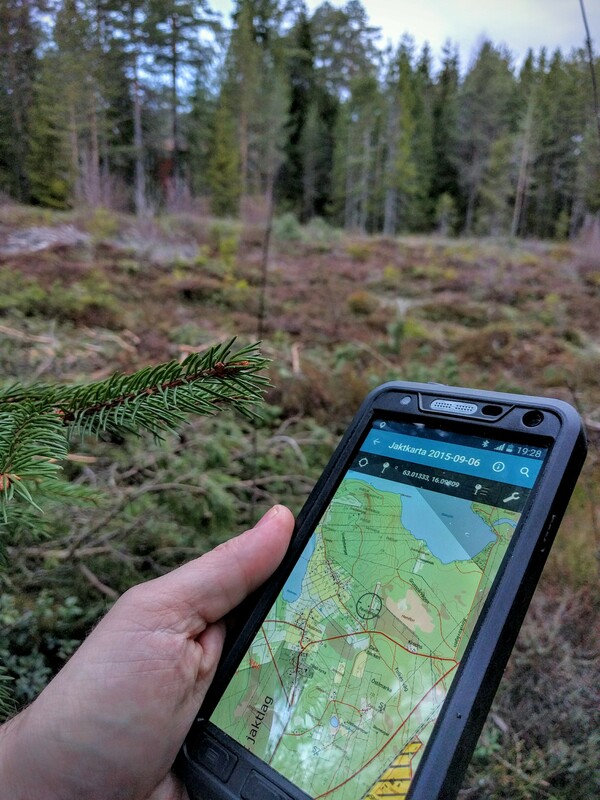 In recent years there have appeared various apps for smart phones that offer hunting team relatively flexible solutions to create hunting maps. They all have their advantages but also some disadvantages. In this article we will look at another solution that offers you as the maps responsible quite easily managed system that your hunting friends will be able to use in their Android, iPhone or Windows Phone. In addition, you can print how many prints you want. The basis of it all is the phone app PDF Maps from Avenza, and the map creation software QGIS. Also, the image editing program GIMP will be use. The first thing you need to do is to get a base map for your hunting area. National Map is a great resource for maps and you’ll be able to download one or more maps from there to be used in the map creation part later. Make sure to download as much area as possible since you don’t want to have some parts of your area of interest not covered by the base maps. When you got the base map(s) downloaded you will need the software QGIS (formerly known as Quantum GIS, Geographic Information System). This is the program that you will do most of the work in. QGIS is a so-called “open source” project and is thus completely free for you to use. It is available for Windows, OSX and Linux and is downloaded via their website www.qgis.org. The program is very competent and you will grow in your map creation skills for many years before reaching any sort of limitation. If you downloaded any maps in so-called raster format, you might want to edit these in some way. To do that you could use pretty much any image-editing program out there but to continue to “open source” path, I recommend GIMP, which is also available for Windows, OSX and Linux. It is totally free of charge and you download it from their website www.gimp.org. In addition to the basic topography map, you will want to mark out your hunting spots, paths and possibly roads. The simplest way to manage these is by using a so-called GPX file. The GPX files are possible to get from your or your hunting buddies GPS devices or create it yourself with the help of apps on your phone. To manipulate these files, there is a free program for Windows called GPX Editor. But remember: everything that GPX Editor is capable of doing can be done directly in QGIS but it’s a little more to fiddle with. If you don’t have a GPX file available, you can create one using your mobile phone. A great app for this is the free software PDF Maps. It’s available for Android, iOS and Windows Phone, which allow your friends to use the same application regardless of phone manufacturer. PDF Maps will also be the app that you’ll use together with your custom made hunting map. A big advantage is that the app is completely independent of the internet after the map is downloaded to your phone and that will make you able to use it way beyond the cellular reception. The app has a very low learning curve and also the most technology reluctant hunting friend will be able to figure out how to use it. If you decide NOT to create a custom map you may want to purchase a ready made map through the Avenza Map Store. They offer a wide variety of ready made maps (press button below to go to the store). The simplest way possible to distribute the digital map to your friends is to use an so-called cloud storage service with the ability to share files via the direct link. We recommend Dropbox for this purpose, but other online services will work. On the downside, pretty much all online services create links that tend to be very long and thus a bit complicated to verbally communicate to others. It is recommended that you shorten links and create a QR code to easily share the map when you’re out in the woods or maybe at the morning gathering. A great service for this is goo.gl from Google where you can easily paste your link and then get a short link together with a ready-made QR-image (also some track back statistics on how many times the link has been used are possible if you login with your Google account). Although it is fun and awesome with a fully digital map, there is no reason to stop using an old-fashioned paper map. Paper, unlike phones, works even when the power has dried up and it’s easier to get an overview of a larger area when you have the full map printed on paper. The one does not exclude the other, and it is good if your hunting team has access to a color laser printer and a laminating machine . When it comes to printers there are a plethora to choose from but I have discovered that there are very few laminating machines that are really suitable for hunting maps. In most shops, there are machines that laminate paper, but virtually all provide a very stiff plastic protection that has a tendency to sound a bit like a rumbling sheet metal when you use it out and about. I have only found a few models that allow so-called cold lamination. The machine’s two rolls of tape with the width of a sheet of paper paste in a thin film that is quite soft and flexible. The machine is not completely flawless, it has a tendency to pull the paper slightly awry due to the fact that it is cranked from only one side, but for this purpose it is a needed investment. That said, the paper map can do without power but it doesn’t goes the same with phones. Therefore, it is wise to get a so-called “power bank” to your phone. 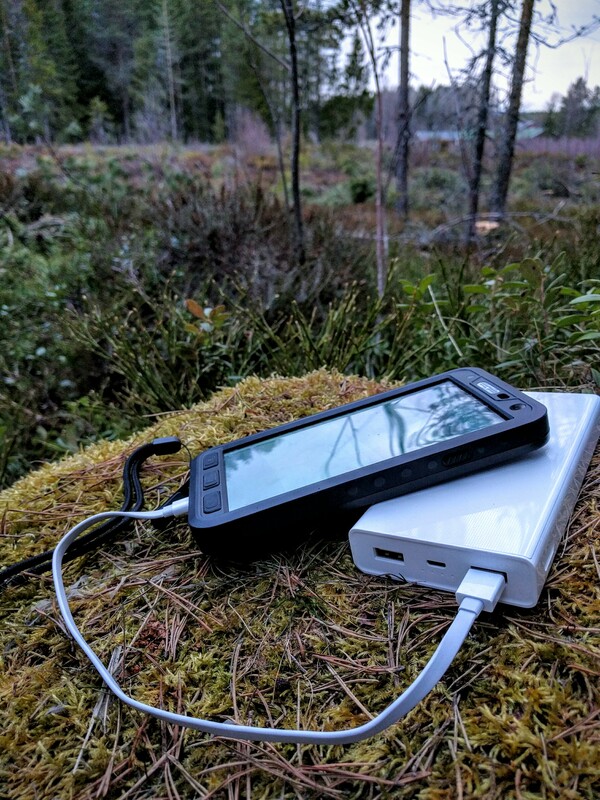 It simply serves as a spare battery that you charge at home and when the battery in your phone starts to run out of the woods, because you might have played a tad too much with it, you can charge the phone using the power bank instead of a wall outlet. It is recommended that you buy a battery pack with at least three times as many mAh that your phone’s battery. Today that corresponds to a battery pack of about 10,000 mAh , but there is power bank’s with a whopping 20,000 mAh . Of course, today there are players other than those I have listed in this text, but I believe that there are those who want a little more control over their maps than let it lay in the hands of a software developer which often requiring partial or permanent access to the internet. And certainly, the PDF Maps app does not let you see where your hunting buddies are in real time or where the dog runs at this particular moment but the collective cost for the team is very low. The only cost is possibly a color laser printer or laminator, and time from the map administrator. If you have your phone ready with PDF Maps and the map downloaded, you can head out into the woods and decide to record where you go, for example to document a trail, or perhaps a newly layed road which has not yet been updated to the National map. The same applies for clearing hunting spots and inventory of these. When you stand on hunting spot, pin a pin that describes the exact location for the point of interest together with information about the spot. When finished, email this information to your hunting companions or to the map administrator who can then load it on the map in minutes. Another clever feature is that in QGIS you may easily create print templates which can consist of one or more pages in a PDF file. There, for example, a map view of an area and the second page a list of the hunting spots that appears on the map listed along with the coordinates, names of the post, directions, and maybe things the shooter should be observant about. Everything that is in the GPX file and the map can be automatically printed. Another bit more excess way to use QGIS is to document all wildlife sightings (time, place, number, type of game, any kills, etc.) in a GPX file and then create a “heat map” showing where the animals go and how it may have changed over time. The possibilities are almost endless and it’s basically just your own creativity that limits you. Being a map administrator has simply become easy and fun, and the risk is that even if you thought you’d spend less time with the map managing, you want to improve the map far more than might be necessary. It all may sound complicated and yes it requires some dedication, but you will save a lot of time. You will increase the quality of the map, and the distribution will be easy for even the most nontechnical. To get started with the map creation, you can surf to my guide (not yet online) where I will go through the whole thing from start to finish. If you do your job the first year you will save a lot of time the following year. I hope you have been inspired to take map creation to the next level. ← Why use Crocs shoes?